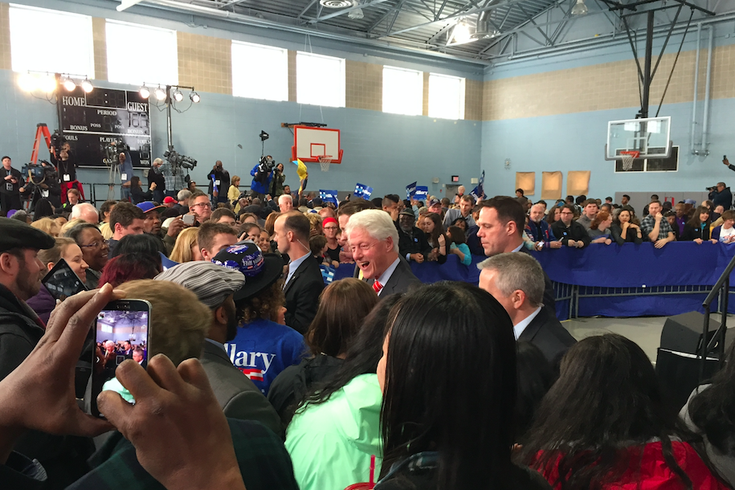 Former President Bill Clinton spoke to Hillary Clinton supporters during a rally at the Dorothy Emanuel Recreation Center on Thursday afternoon. Protesters made their voices heard during his 33-minute speech. Former President Bill Clinton stood before a “Fighting For Us” backdrop at a Philadelphia recreation center not far from the Cheltenham Township border on Thursday afternoon and made the case that a certain relative named Hillary should assume his former job. The candidate wasn’t in this nook that some call Mt. Airy and others call Cedarbrook, after all. Both U.S. Rep. Chaka Fattah and state Rep. Dwight Evans, who also will face off against one another on primary day, were among several hundred in attendance, though. They stood close to one another and near students who took a field trip from the neighboring school to sport Hillary-logo stickers, dance, and chant “HRC!” and “I’m With Her!” at a political rally. Formally introducing the former president were Mayor Jim Kenney, former Mayor/Gov. Ed Rendell and former City Councilwoman Marian Tasco. “Philadelphia has always had a special relationship with the Clintons,” Rendell said. Then, Bill Clinton took the stage just before 2 p.m. and said he owes the city big time, what with it turning out in big numbers when he ran back in the 1990s. Shouting out the Villanova men’s basketball team for winning the national championship, he then delved into issues that impact urban areas like Philadelphia and spoke about what makes the country great (the "eds-and-meds" dynamic that figures prominently in the city factored into that explanation). “I believe we’re just this close to being able to rise,” he said, noting no countries have been able to recover from a recession like that which America faces within 10 years. It was certainly a message that ran counter to Sanders’ from the night before. Sanders calls for a “political revolution,” while Bill Clinton maintains the nation remains great as it sits almost all the way back from economic turmoil. Instead of revolution and protests, he said, people should look for positivity in the nation’s world standing. “It’s the only proposal by any campaign that will hold down the cost of college,” he claimed. Moments later, the event veered off script as protestors including Erica Mines shouted Bill Clinton down and held signs reading "Hillary Clinton Is A Murder" and "Black Youth Are Not Super Predators." Their objections stemmed, in part, from the 1994 crime bill that Hillary recently labeled "a mistake." Though Bill Clinton tried to engage them in discussion "about the increased sentencing provisions" of that bill – "Now wait a minute: I listened to you. You listen to me," he said in an increasingly agitated tone, noting the political compromises inherent in getting that bill to pass in the first place – the pro-Hillary chants echoed off the walls. "Hillary didn't vote for that bill because she wasn't in the Senate. She was spending her time trying to get health care for poor kids," he said. "I don't know how you would characterize these gang leaders who've got 13-year-old kids hopped up on crack and send them out onto the streets to murder other African American children. [To the protesters] Maybe you thought they were good citizens. She didn't. You are defending the people who kill the lives you say matter. Tell the truth." The protestors were not asked to leave the gymnasium, though, and held court with reporters who flocked to them after the 33-minute speech wrapped up (video below via Jenny Drumgoole). "We get labeled as 'the thugs' and all that, but we silently held up our signs up and we have a right to do that," Mines said. "We have a right to do that, as the First Amendment allows us to. ... They asked me to take my sign down because they didn't like the fact that it didn't say, 'Hillary is God,' and that's not OK. That's not OK.
"I can do whatever I choose to do, just like everyone else. I'm not here to say Bill Clinton or Hillary Clinton is a good or bad person. Their policies have hurt the black community. That's all there is. It's not about whether I like them. I don't hate them as people. I don't hate anybody, but their policies have hurt the black community, and they don't deserve the black vote."